The Second World War is possibly one of the most studied conflicts in human history. Recent efforts in the academic and popular writing market, as well as large budget productions such as Saving Private Ryan and Band of Brothers, coupled with the rapidly declining numbers of World War II veterans has only increased our appetite for stories from this monumental conflict, and as a result, a large number of books, television documentaries and movies have capitalized on the events of 1939 to 1945. Robert Edsel and contributor Bret Witter have put together a monumental (no pun intended) book entitled The Monuments Men: Allied Heroes, Nazi Thieves, and the Greatest Treasure Hunt in History that paints a vastly different picture of the war than has been seen before. While much of the attention paid to the soldiers involved with the fighting, Edsel presents a mission that had far larger connotations: while the fighting forces were preoccupied with saving Europe and containing Nazi aggression, a small, relatively unknown group of soldiers were tasked with the almost insurmountable task of saving something far greater: the elements upon which European culture rests. 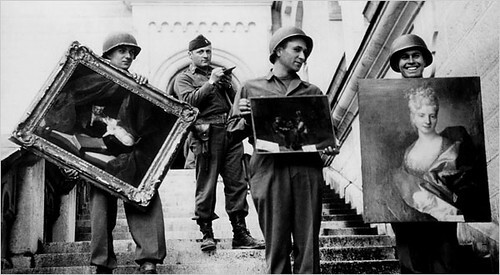 The Monuments Men were the ones who would locate, preserve and document the artwork that the Nazi military stole from the countries that it conquered during the course of the Second World War. Over the course of this book, Edsel tells the story of a small, dedicated group of individuals who, with very little support and even less authority, set out as the Allies invaded the European mainland and worked accomplish their impossible task. In doing so, he not only talks about the people who are involved with this venture, but also examines some of the crimes that the Nazis perpetrated during the war: the theft and destruction of art, using artwork as evidence of Nazi superiority (and of other races inferiority), but also the blatant disregard for the care and well being of artwork. Moreover, the lesson that is never quite forgotten over the course of the book is the casualties of war, especially amidst the destruction in Europe. Thinking back to when I was in England in 2006, I remember hearing about some of the efforts that went into preserving some of the cultural artifacts around the country: ancient cathedrals were reinforced, stained glass windows were taken down and put away and artwork was stashed far from where they could be harmed. Other places weren't as lucky, and as Nazi Germany rolled into the rest of Europe, artwork was captured or destroyed. Edsel starts off his book quickly, looking at some of the concerns that museum officials and art professionals had as the war started, and looks at the highly public effects of the destruction of history had upon the Allies and Axis powers. A particular case in point was the Allied destruction of Monte Cassino, which helped to prompt a greater awareness of the sheer impact that heavy-handed militaries might have, and how wonton destruction of targets could be harmful in the long run, something that would impact the conduct of war later on. While Edsel doesn't dwell for too long on anything but the Allied conquest of Europe and followup actions after the war, or just a small number of characters out of the 345 or so men involved with this unit, what he does is highly effective by bringing both the larger themes of this struggle, but also enough human faces to the table to allow any reader to relate to what was going on after the front lines passed. Most notable is George Stout, of the US Naval Reserve, who was involved early on in the Monuments, Fine Arts and Archives project. One of the first Monuments Men to travel into Europe, Edsel notes that he took only one or two days off during his entire time in the theater of operations, working tirelessly to document thousands of sites and items. Harry Ettlinger had fled from Germany and joined the US Army shortly after high school, becoming an important member during the operations in Europe. Captain Walker Hancock, Lieutenant James Rorimer, Captain Robert Posey, and more from the US Army make up a fascinating cast of characters, all of whom are not only written about, but do some of the writing themselves, as Edsel has included a number of their letters in the book. Beyond US Army personnel, Edsel also talks much about Rose Valland, a French woman who works tirelessly, as a volunteer at the Jeu de Paume museum and spied against the Nazi occupation to preserve the art in the museum, as well as Jacques Jaujard, the director of the French National Museums. Edsel takes only a small number of interesting figures that were involved, but just enough to ensure that the book isn't bogged down with an endless number of figures. Those who are represented are facinating, with a diverse number of backgrounds, all brought together by this extrordinary task. These characters, while most never interact with one another, save for occasional mission, are intertwined with the Nazi plans for artwork as the war turned in the Allies favor, and Edsel pieces together the actions of this diverse group to show just what happened in Europe during the war. As the fighting passed over Europe, the Monuments Men were never very far behind, working to examine and to guide restoration and continuing preservation. At times, they helped to redirect Allied war efforts to better preserve sites, created lists of buildings that should be avoided and worked hard to locate missing works of art. Other times, they would document the damage, or rush in to try and locate a valuable statue that watched the fighting move past. Edsel traces their path through Europe, starting with Operation Overlord, and pushing through France to Paris, to Germany and Berlin between 1944 and 1945. In doing so, the reader is shown a different view of World War II than what has been largely popular: the aftermath of the fighting, when the Monuments Men largely went to work. They would task local villagers to help fix damaged structures, helped with logistical operations, would survey and document hundreds of sites, all with very little support, often with just one soldier in hundreds of square miles. What has astounded me more, however, was not just the task that these men faced, but that their story has never fully been explored or told, as the ending of the book states. Their story was one that sat in the background, largely taken for granted and lost to the larger picture. It is a shame, because their story is possibly one of the more important, for this was what was at stake when Hitler invaded Poland in 1939. The Nazi government had sought to supplant all creativity by replacing it with their own, hording everything deemed important to the state, with everything that was seen as subversive destroyed by fire. Much was lost forever, and undoubtedly, much is still unknown and lost, waiting in dark shadows to be found once again. The efforts of the Allied forces demonstrates a broadening of thinking beyond just the next objective and enemy soldiers to be killed, and that there was a recognition of the importance of culture and buildings beyond their immediate impact on the battlefield. The battlefield, in a sense, was Europe, and those in danger were those made of paint and bronze, who look back and show us a glimpse into the past, into the minds of the artists who helped to make Europe what it was.